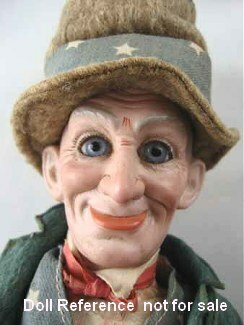 Cuno & Otto Dressel, portrait Uncle Sam doll 13" tall, doll mark Germany S 8. 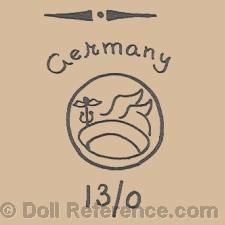 The Dressel family toy and doll business in Sonneberg, Germany has a long history, it passed from one generation to the next, by 1873 the company was known as the Cuno & Otto Dressel Factory. 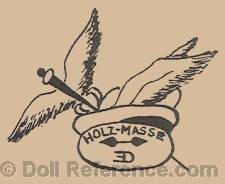 Dressel purchased bisque doll heads from noted manufacturers such as: Simon & Halbig, Ernst Heubach, Gebrüder Heubach, Limbach, Armand Marseille and Schoenau & Hoffmeister, they were also supplied by other small doll factories and home workers. Dressel's largest American client was Butler Brothers. 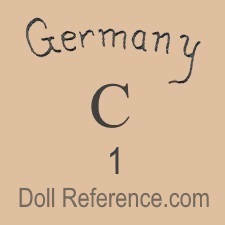 Dressel expanded to three factories in which; dolls were produced in Sonneberg, metal toys in Nurnberg and wood toys in Grunhainichen, Germany. 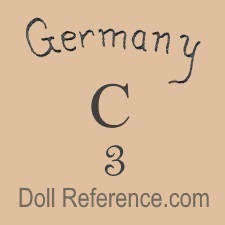 Over the years Cuno & Otto Dressel produced dolls of bisque, celluloid, china, composition, hard paste, papier mache, wax or wood; Täuflinge or baby, child, lady and portrait dolls. 1898-1903 Dressel Portrait Character Doll Series, 10-15 1/2" tall, bisque heads with portrait face, glass eyes, composition jointed body. 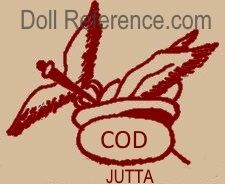 Some Cuno & Otto Dressel character doll names are; No. 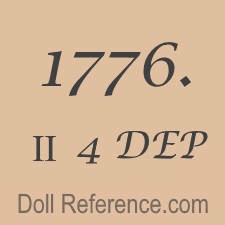 2736 Admiral George Dewey doll, No. 2736 M. Miles doll, No. 2736 Admiral William Thompson Sampson doll, Admiral Winfield Scott Schley doll, Admiral Charles Dwight Sigsbee doll, No. 2736 President William McKinley doll, Richmond Pearson Hobson doll, Buffalo Bill doll, a Farmer doll, Old Rip doll, Uncle Sam. All dolls are dressed in their uniforms or appropriate to their character clothing, all bisque heads were supplied by Simon & Halbig. 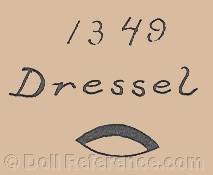 Dressel Portrait Character doll marks; A, D, R, S letters plus a size number, see below Uncle Sam doll mark; made in Germany S 8. 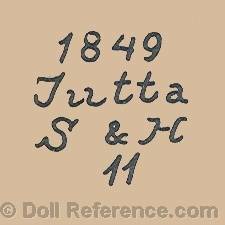 Some Dressel doll trade names: 1903 Fifth Avenue dolls, 1906 Jutta doll molds; 1348, 1349, 1909. 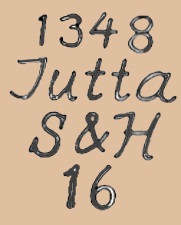 Bambina dolls, 1910 Jutta Baby doll molds; 1912, 1920, 1922. 1912 Poppy Doll (School boy), Superior, Victoria, Holz-Masse (wooden composition) 1926 Sonny or Sunnie a baby doll. 1927 Kissie and Lotte dolls. 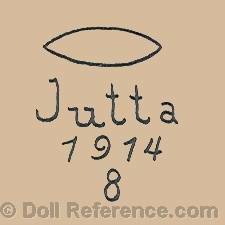 The Jutta doll is named for Countess Jutta, a patroness of Sonneberg. 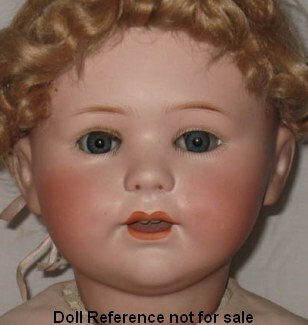 Cuno & Otto Dressel 1910 Jutta Baby Doll, 24" tall, bisque socket head, multi stroke painted eyebrows, painted upper and lower eye lashes, sleep eyes, open mouth with upper teeth. 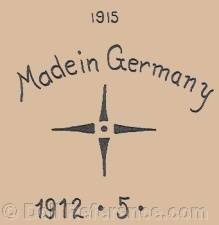 Composition jointed bent limb baby body, on back of head doll mark Made in Germany, four pointed star, 1914. Cuno & Otto Dressel 1912 Poppy Doll, 13-14" tall, sometimes called by collectors an American School Boy doll, has a bisque shoulder head, molded painted hair, plus some may have flocking, painted single stroke brows, painted upper and lower eye lashes, stationary fixed glass eyes, closed mouth. 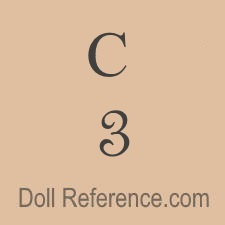 Cloth or leather stuffed jointed body with bisque or composition lower arms, cloth or composition lower legs. 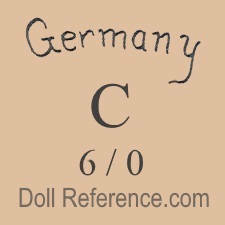 Doll is marked with an oval label (as shown below) usually in red ink on his chest; Trade, winged helmet symbol, Mark, Poppy Doll, Germany. Doll mark on back of head 10/0, probably indicating a size or model. 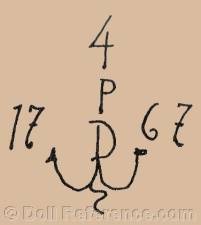 Bisque flange heads marked 5/0 on all composition jointed bodies have also been found and there may be other sizes or similar markings, too. 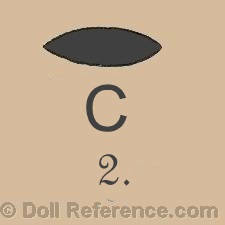 Cuno & Otto Dressel doll mark oval hole C 2. 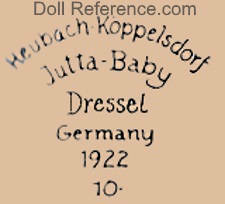 Cuno & Otto Dressel doll mark Heubach-Koppelsdorf Jutta - Baby Dressel Germany 1922 10. 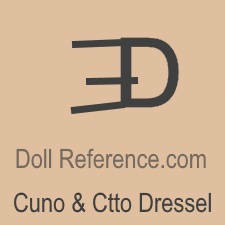 Cuno & Otto Dressel doll mark made in Germany S 8. 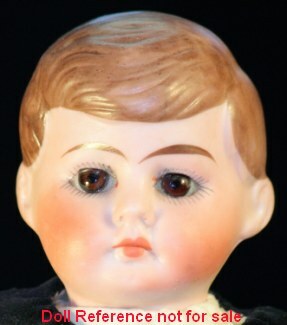 Limbach doll mold 8679 is a pouty character boy doll attributed to Dressel.